After I took a couple pictures, I started up a little conversation with them, and found out there was going to be a larger gathering of DBZ cosplayers at 12:30 pm. Awesome! Not only people of my own kind, but multiple super-nerdy people of my own kind! Once we got a little dialogue going, I figured it was as good a time as any to mention the website. I asked if it was OK to put the image up on my site, and then if they had ever checked out the DBZ podcast that we do. As the guys over at GeekNights have said time and time again, it’s all well and good that we are trying to get other podcast listeners to check out our own shows, but what we really need is for more people in general to listen to podcasts in general… not specifically our own shows. If they don’t even know what the word means, how on Earth are we to expect them to listen to our piddly shows? Heh, why *didn’t* you say that? Then again, there’s some nice levels of fandom that some people are more comfortable staying in. People may be more interested in more recent stuff, but Dragon Ball will always be there. At least you did plug the podcast to those people, and hopefully you’ve gotten them curious. 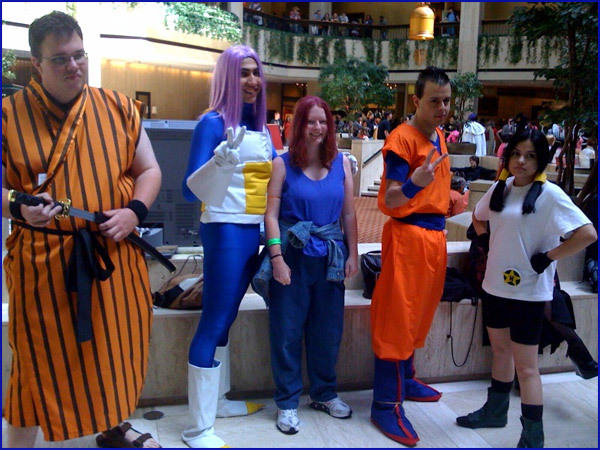 I myself ran into a couple of Dragon Ball fans in the Galleria Food Court. I was overhearing them discuss “who was that one guy that fought Goku early on, and then later came back to fight him again?” After we all tried to jog each other’s memories, I then said, “Tao Pai Pai”. They were like “THAT’S IT!” and we spent the next 30 minutes or so eating lunch together and sharing Dragon Ball/DBZ stories. I did plug your podcast (as I always do), and surprisingly they were familiar with the podcast and your site. Bottom line: Don’t be discouraged about people not knowing what your Daizex.com Podcast is all about… you’ve got plenty of listeners already. I’m sure they spread the good word about it to their friends who are also DB/Z fans. Sometimes, the best DB/Z fans are found hidden in plain sight. Yajirobe never struck me as being all that bright anyway so don’t worry. It does amaze me that someone can attend cosplay events (presumably he got the details off the interwebs) but miss something as wide spread as podcasts. I’ve only discovered Daizex.com recently but I love the podcasts already. Who is that playing Videl? She is really cute.